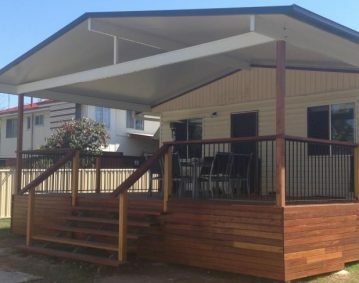 The Hunter Douglas Shademaster Shelter Systems provide an easy to maintain, long-lasting and durable roofing solution, however it’s still recommended to provide regular care to your product. With one quick spray you will remove most of the surface dirt created by dust or rain residue. Special attention should be directed at areas that miss the rain like eaves, awnings and under verandas. 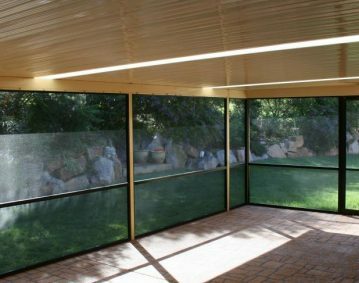 If you have a screened Enclosure, hosing the screening regularly will prevent grime building up in the mesh. You can wash away stubborn surface grime with a soft brush or sponge soaked in warm water or detergent. Use regular dishwashing liquid, one teaspoon in four litres of water. To be most effective you should change the water frequently and wipe over a second time with a clean towel to remove any smears. Best results occur when washing is undertaken in the shade. Areas constantly damp could suffer from the formation of mould. You can remove the mould with a solution household bleach and water at a ration of 3:1. Rub the solution onto the surface with a soft sponge, leave for 20 minutes and then rinse off with clean water. When dry you should rinse once more with clean water. Gutters should be kept free of leaves and dirt build-up. 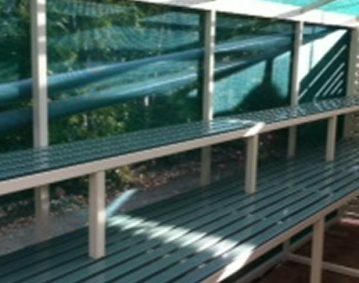 For the Shelter System enclosed gutter, this can usually be done by inserting a hose in the water outlet and washing leaves to one end, then removing them. The gutter corner cap can be detached if there is an especially large build-up (in a very leafy section it would be worthwhile to ask you supplier to fit leaf guards.